So you want to learn about starting a blog. But there’s one question you should answer for yourself before you actually start your own blog. That question is “why?” Creating your own blog is a fun and fulfilling thing to do. 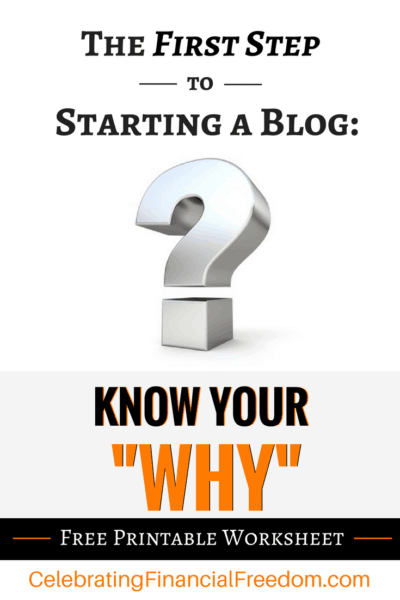 But if you don't know “why” you want to begin blogging in the first place, it's unlikely you'll stick with it for very long. This post will help you figure out your why and provide a free printable worksheet to ask yourself the right questions and organize your thoughts on paper. It doesn’t really matter what your “why” is. What matters is that you have one in the first place. There’s no right or wrong answer here, but knowing exactly why you want to start your blog is important so you can develop some focus about what you’re trying to do. 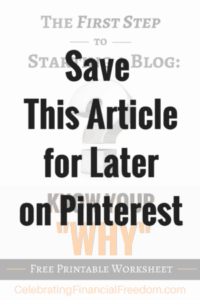 At the end of this post I’ll give you access to a free printable to help you start getting your “why” together on paper. That way you can start your blog with focus and purpose instead of being all over the place like I see with so many beginning bloggers. I'll show you how to get even deeper into the process in a later post. Everybody has a unique set of skills that no one else has. You might be an astrophysicist, a quilt maker, a school teacher, or a software expert. No matter what your skillset is, there is somebody out there who wants to learn what you know. Starting a blog gives you the ability to teach people the world over about the subject(s) you know best. Even better, you can make money with your new blog sharing your knowledge with others (see below)! Maybe you feel like your skillset isn’t all that unique. But that’s ok, because nobody does it the way you do it! Just providing a unique perspective on what you do or how you think is a great way to affect people in a positive way. Your unique take on things can be just what someone else needs to feel better about themselves, do better work, or just learn to do something new! Sometimes just putting your thoughts down in written form helps you learn more about yourself. One of the great things is that there are other people out there who want to be part of a community that can help you along in your journey. Maybe you’re a new mom trying to figure out this “parenting” thing. Or a recent graduate starting a new career. You might even be undergoing a health crisis or other major life change. As you grow traffic and get more followers, you’ll form a community of like-minded people. They'll help and encourage you (and each other) toward personal growth in a way that you just can’t get by doing it alone. Starting a blog can be a great way to make money on the side. Even better, you can grow your blog into a full-time business if you really want to. I know people that make as little as a few hundred dollars a month on the side to well over $100,000 a month blogging full time. The potential is truly unlimited! Blogging as a business can provide you with the freedom to set your own hours, do something you love, and be your own boss. Even better, if you set up your business right, you can earn passive income with your blog while you sleep! All that stands between you and huge blogging success is you! Some people start a blog just for fun. Maybe you’re not interested in making money or teaching people something. You can just use your blog as a social outlet if you like, sort of like a public online journal. Talk about anything you like and just be yourself. It’s a great way to blow off a little steam and bring others along for the journey. So now you can click here to download the free printable I mentioned. Just fill it out to help you start getting clear on your “why”. This post is part of a special 7 day email course about how to create your own blog. You can sign up for the email course here or in the signup box below.